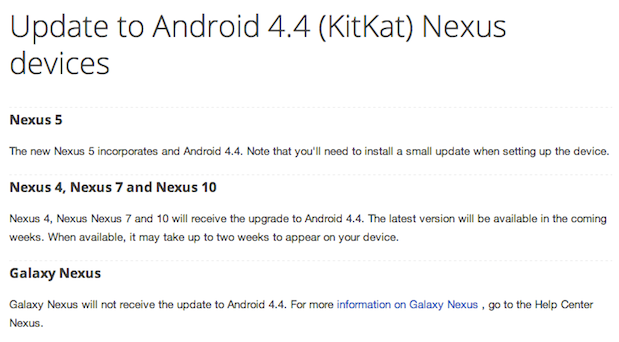 From the horse's mouth, we're hearing some unfortunate news: Google has taken to its Spanish support pages to announce that the Samsung Galaxy Nexus is not on the list of devices to receive Android 4.4 KitKat. This seems a bit odd, given the new update's focus on "the next billion" and offering solid performance to other budget devices, but at the moment things aren't looking up for owners of the phone -- or any older Nexus devices, for that matter. We've reached out to Google for clarification on this and will update you if and when we hear back. Update: There's still no official word on why this is the case, but sources close to the company have pointed the finger at a different hardware issue on the Galaxy Nexus: its Texas Instruments-built chipset. The company is out of the mobile business and as such isn't in a great position to give the support necessary for continuing OS upgrades -- presumably some of those 1,700 employees let go in the shift away from mobile could have helped. Now we'll have to see if the community can pick up where the corporations left off or if this is the end of the road for the Gnex and its other OMAP-based kin like last year's Kindle Fire HD, Nook HD and Droid Bionic.